Expertise has become a self-proclaimed qualification. 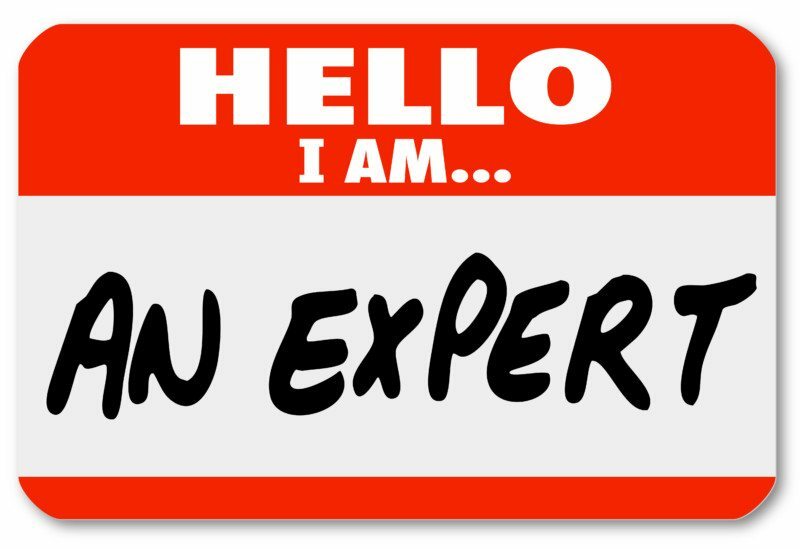 Experts become experts by calling themselves that. Equipped with little more than fifteen minutes of Wikipedia knowledge, everyone and their cousin can claim expertise on something and begin spreading nonsense to the masses. As if the term “expert” were going out of fashion, various other terms have been invented that essentially mean the same thing. Thought leader. Influencer. Authority blogger. These days, you can find an expert on every corner with confident declarations and predictions. What they lack in knowledge, they make up for by cranking up the drama and assertiveness. News stations looking to feed the 24-hour news monster resort to their usual roster of experts to evangelize knowledge that they don’t have. I get it. The world is an increasingly messy place. As viewers sag in confusion trying to interpret the unfolding facts, the experts provide us comfort. They don’t bother us with ambiguity or nuances. They provide clarity of opinion so we can retreat to the comfort of our Facebook news feed. But here’s the problem: These opinions are wrong far more often than you think. Expert opinion is particularly damaging since it carries more weight than the opinion of a non-expert. It’s one thing if your friend tells you that complex carbohydrates should make up the majority of your diet. When that same statement has the backing of the U.S. Department of Health, and the experts commissioned to propagate their views, the opinion assumes a much different quality. Expertise breeds arrogance and hubris. It smothers nuances and complexities. It blinds us to possibilities. The Earth revolves around the sun? Nonsense. Can you put a man on the moon? In your dreams. Can Donald Trump be elected President? No way. Experts foolishly confident in their predictions build a theory without gathering all of the facts—which, if you know your Sherlock Holmes, is the worst mistake an investigator can make. Once the theory is created, reinforced, and retweeted, it becomes the truth. And we refuse to let the facts disturb it. What’s worse, as the supposedly unthinkable becomes reality, the experts aren’t called out for their errors. The same experts that were wrong about the war on Iraq, the election of Donald Trump, or the prospects of Brad and Angelina’s marriage, aren’t fired. They aren’t even benched. No one says, “Maybe you should sit this one out, Dr. Stu, since 50% of your opinions have been proven wrong.” By then, we already moved onto the next, shiny, exciting piece of breaking news. Last year, when I set out to write a book about military coups, the experts had already reached a conclusion: Coups are bad for democracy. No buts, no ifs, no exceptions. During my research, I uncovered numerous coups that didn’t fit this pattern. These coups toppled dictatorships and built democracies, rather than destroyed them. When I made this claim at a conference, a senior scholar (who shall go unnamed) awoke from his daydream, turned his head deliberately in my direction, and gave me the same type of stare that the Cardinals may have given Galileo for asserting that the Earth is round. Challenging the experts was academic heresy. Whenever someone asks me to express an “expert opinion,” I instinctively look behind me to see if they’re speaking to someone else. I’ve been a law professor for seven years, but I don’t consider myself an expert. I hope I never will. I’m constantly learning. I’m continuously revising my opinions. Once I declare myself to be the expert on anything, I fear that my learning will stop. I’ll put blinders on and start announcing confident conclusions that inevitably turn out to be wrong. In so doing, I’m following in the footsteps of one of my personal heroes, physicist Richard Feynman. Even after he earned a Nobel prize, he didn’t see himself an expert. Instead, he thought of himself as a “confused ape” and approached everything around him with the same level of curiosity, enabling him to see nuances that the experts dismissed. Wieden + Kennedy, the advertising firm responsible for many of Nike’s blockbuster ad campaigns, encourage their employees to “Walk in Stupid Every Day” to approach problems from a beginner’s viewpoint. Questioning authority is a muscle we rarely exercise. We’ve been told to color within the lines, do as our teachers say, and use # 2 pencils. As with other muscles, when left unused, it atrophies. The next time someone tells you they are an expert, put that muscle to use. Because the world needs fewer experts and more confused apes.